An Exalted Venus along with Mars and the Moon scripts the phenomenal success of Zakir! The Astrological Portrait of the Tabla Legend! Ustad Zakir Hussain's exalted Venus , the lord of his Ascendant is the planet of music and arts placed with Mars the planet of energy and consistency, and the Moon the planet of attraction in the Jupiter's Pisces sign of expansion . All the three planets posited in their friendly sign in his chart. This has made him legendary tabla maestro who has contributed largely to the filed of percussion and music at national and international level. His consistent and brilliant performances mark him as India's greatest classical musicians due to the combination of trio planets in the house of gains in his Chart. 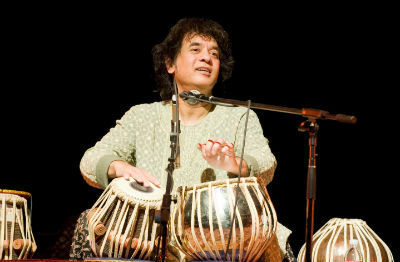 Ustad Zakir Hussain is born with the artistic Sign Taurus on the Ascendant. Taurus, the Sign which naturally stands for the artistic and finer areas of life like Music, and it being the Ascendant sets the trend for the rest of the Horoscope. Taurus as the Ascendant for an artist is a blessing, as the natural qualities represented by this Sign like grace, a great interest and understanding of the nuances of music, a stable bearing, perseverence and determination are the perfect gifts for an artist. The Lord of the Ascendant – Venus is formidably placed in the 11th House, in the Sign of Pisces, which happens to be its Sign of Exaltation. Mars and the Moon, who happen to be the Lords of the 7th House and 3rd House respectively, are accompanying the powerful Venus in the 11th House and this results into a very potent combination and ensures that Ustad Zakir enjoys tremendous artistic flourish! The main areas which happen to be important for a person to excel in percussions and Tabla are the 3rd House and its Lord, as they rule our hands, fingers and arms, the placement of Venus (art) and also Mars (conversion of energy into action and speed) and its inter-relation with other Houses and planets. There is also a very important role that Mercury plays in the success of an artist. It is very interesting to note that there is a perfect synthesis of all the factors mentioned above in the Horoscope of Zakir. The great combination of these three planets, viz Venus with the Moon and Mars has given him extraordinary strength and skill of hands and beautiful control on his fingers, and his talent, as we all know, is one of the rarest in the world. Such is his his speed, that while playing the Tabla, his fingers are almost invisible! Very few are blessed with such phenomenal talent! The mutual aspect of the 3 planets in the Sign of Pisces with the Saturn in the Sign of Virgo, gave him great poise, control, stability and determination. Moreover, this mutual aspect augurs very well for Ustad Zakir as Saturn happens to be the Yogakaraka planet in his Chart and his aspect surely does catalyse the powers being generated by the trio in Pisces. The formation of Raj yoga in the 10th house of his Chart with the Atmakaraka Jupiter, the planet of expansion and wisdom generated within him great inspiration right from from a very young age. The powers being generated by combination of Jupiter, the Sun and Mercury get magnified and augmented due to the presence of Rahu therein and this made made him an outstanding figure in the field of traditional music who cultivated an attractive style of playing the Tabla. The presence of Rahu also lends the power to stand apart and to persevere to achieve something different. There is a Parivartana Maharajyoga being caused due to the exchange between Mercury and Saturn as the Lords of the 5th House and 10th House! Such a wonderful combination leaves no stone unturned in blessing him with sublime glory, fame and prominence! There is also a Rajayoga being caused in the Zenith of his Horoscope, that is the 10th House, as there is a combination of the Lords of the 4th House (the Sun), 2nd House and 5th House (Mercury) and the 11th House (Jupiter). This blesses him with excellent status and overall success. Because of such a powerful combination, he has been able to make use of his talents so well. Due to such exceptional planetary configurations, Ustad Zakir has been able to wow the world like never before! The favourable planetary influences helped him to achieve various awards, recognition and great honour! Millions of people across the world enjoy and cherish the music that he has created and continues to create. He is surely a novel treasure and a minehouse of talent! He has also been conferred with various civilian awards by the Govenment of India and has won great international acclaim as well. He is one of the musicians who enjoys tremendous fan-following across the globe! Ganesha wishes good luck and bright future ahead to Ustad Zakir Hussain.